Ballard Banjers - What's he building in there? 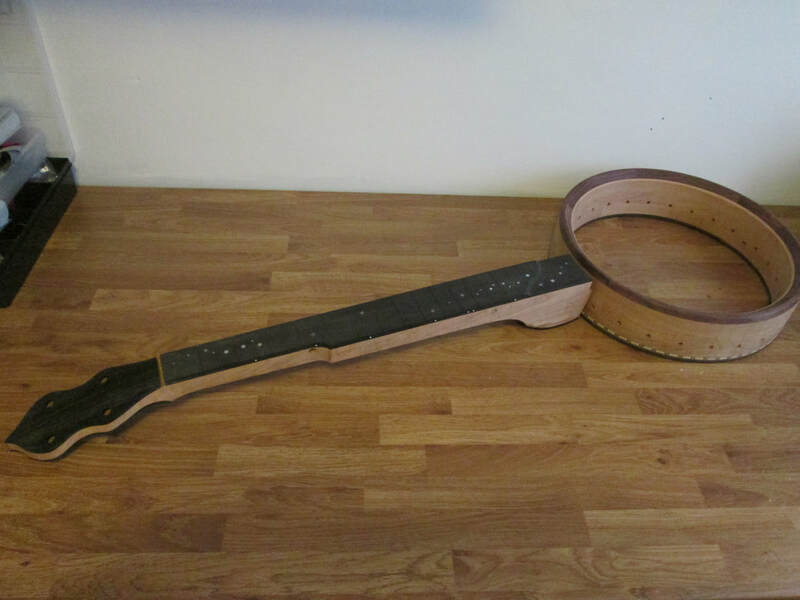 We finally finished my son's banjo...turned out pretty cool! Ash pot and neck, 23.5" scale Rosewood fingerboard and peghead overlay, mother of pearl 'zombie' head, 8" Renaissance head. 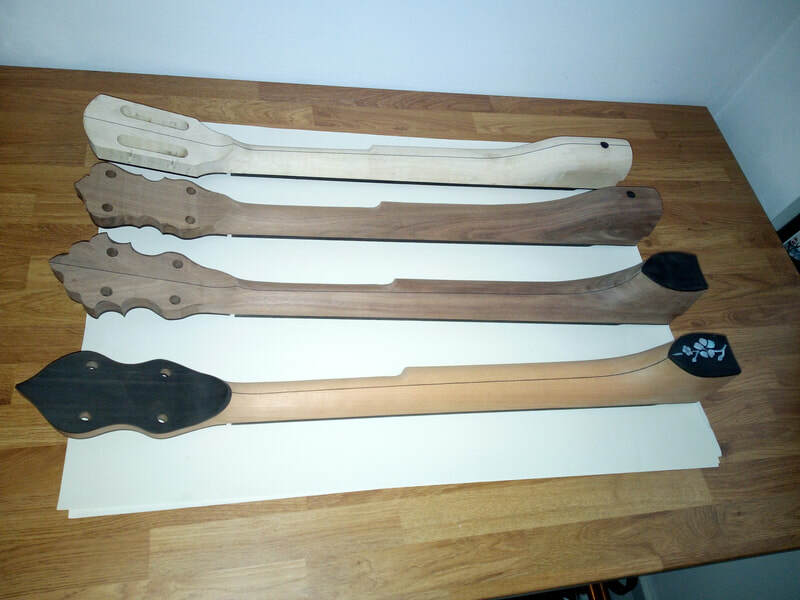 Had quite a productive week, Sam's minstrel should be ready for oiling sometime next week, just need to carve the neck, sand and stain. 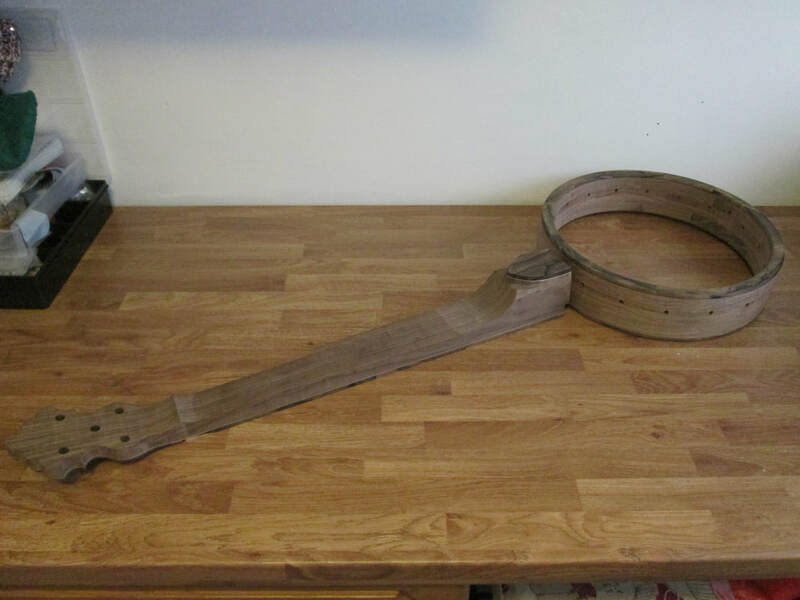 David's Walnut banjo is coming along nicely, rim is glued up (just needs an Ebony cap), neck is also glued up. Glued up David's (different David!) Cherry rim, hopefully get the neck blank glued up next week. 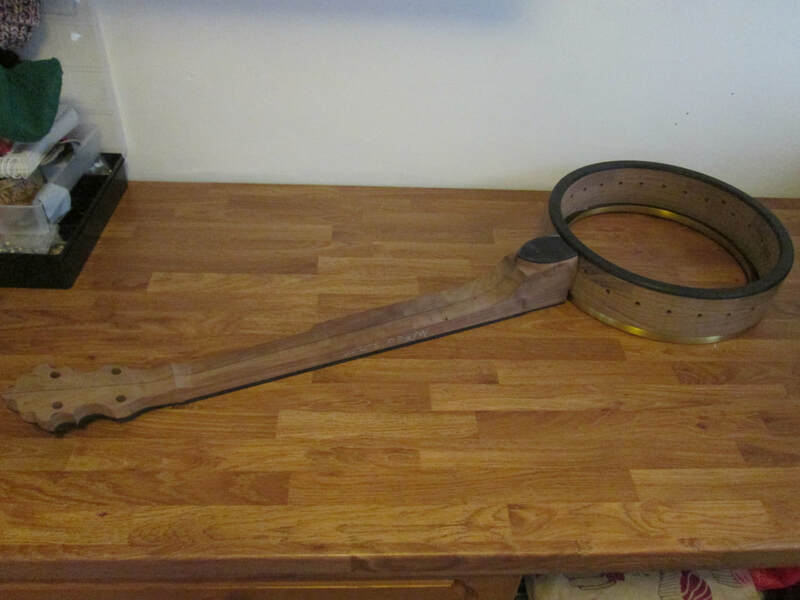 Also hoping to start gluing bits for Matt's Cherry mountain banjo. The last two banjos of the current batch finished this week....phew! 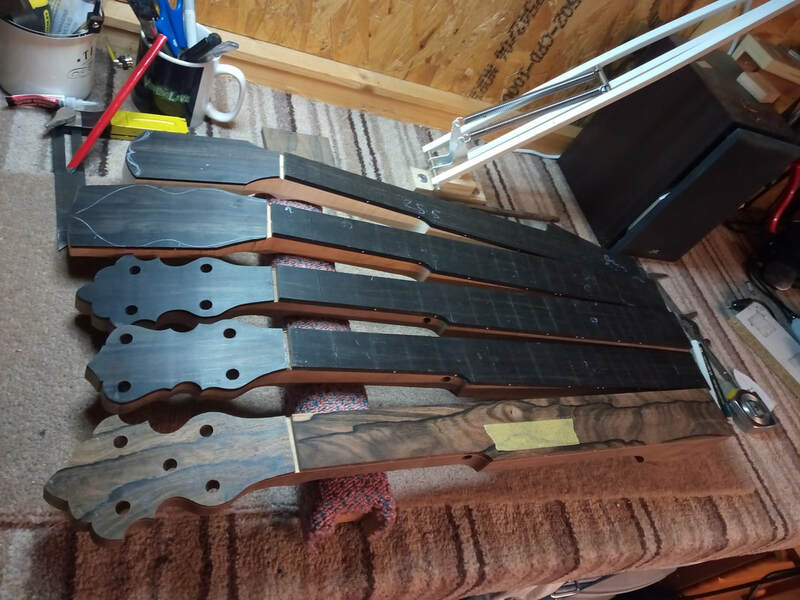 I have a mixed bag to get on with next, back on to Sam's minstrel, a 7-string flush fret, a mountain banjo, a fairly standard open back and a 6 string open back. Should keep me out of trouble! Stock banjo. This will be for sale shortly, full specs will and price will be on the 'banjos in stock' page. Unfortunately it will be Europe shipping only, due to the Rosewood tone ring. 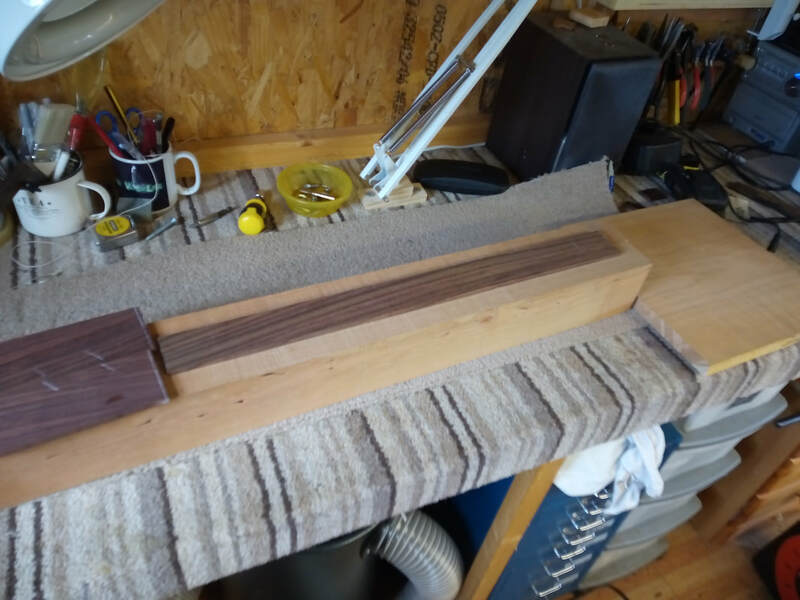 Been finishing up Davy's Cherry banjo and Andrew's 'Kibbo Kift' Walnut banjo this week, both banjos have an awesome sound but I still have a day or 2 of tinkering to coax the best possible tone out of them. 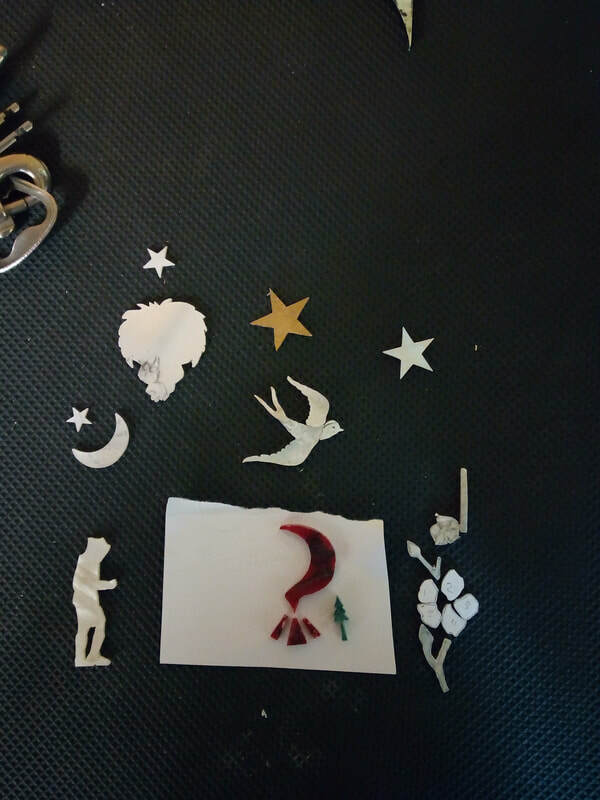 The audio files don't really do them justice, I was struggling to play with a finger pick after sanding half my claw nail off a week or so ago!! ​Some really nice personal touches on both banjos, I'm really chuffed with how the hiker turned out on Andrew's banjo and the Cherry blossom on Davy's. 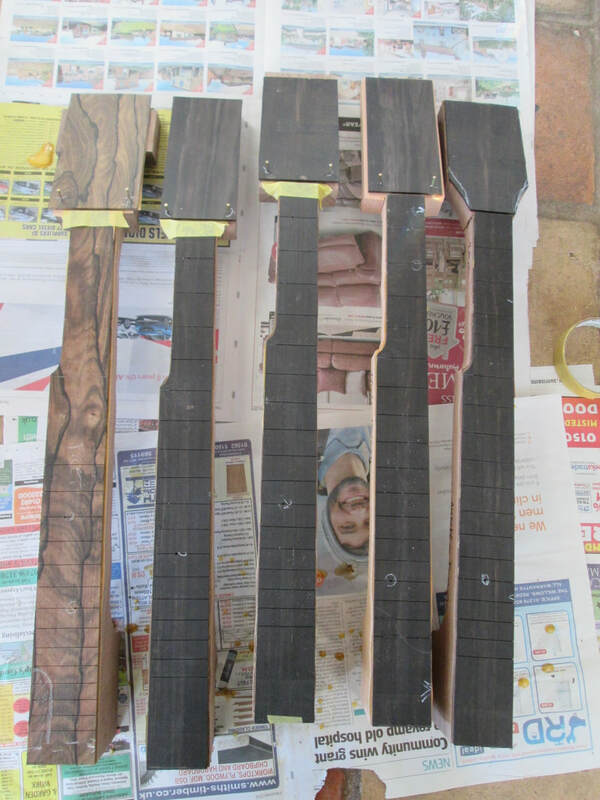 Finished carving the next batch of necks, installed frets and inlay, a little bit of engraving left to do and lots and lots of sanding/scraping! 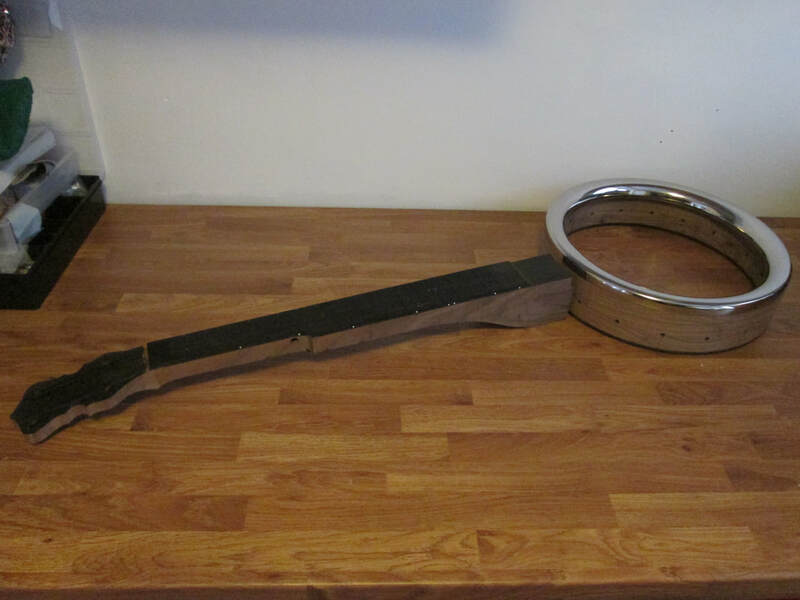 Rims are also waiting to be sanded, hopefully have at least 2 banjos ready for oiling by the end of next week. Top to bottom: Stock flamed Maple, Tom's, Andrew's, Davy's. I've recently started uploading more frequent workshop pics on my instagram page, it's a lot quicker and easier for me to keep customers up to date on progress. Follow on there if you are interested, I'll probably post a few 'how I do it' videos at some point! 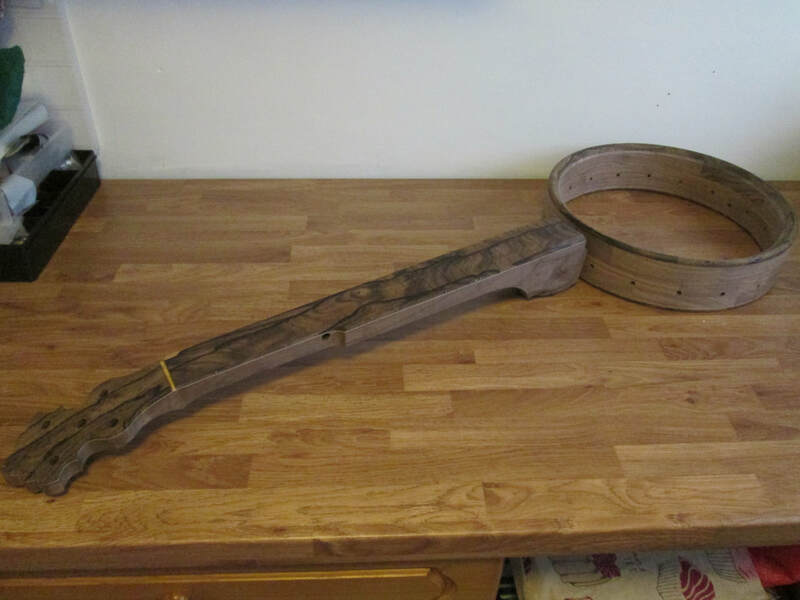 Here we go again, another fun filled year making banjos :) Huge thanks to all my customers for keeping me going! Plenty of cool banjos lined up so far, I still have 3 or 4 spaces left this year if you fancy ordering a new toy for delivery before next Christmas. Prices will remain the same until April, but unfortunately there will be a slight increase at the start of the new tax year, to cover the ever increasing cost of materials, so contact me before then if you are contemplating ordering. 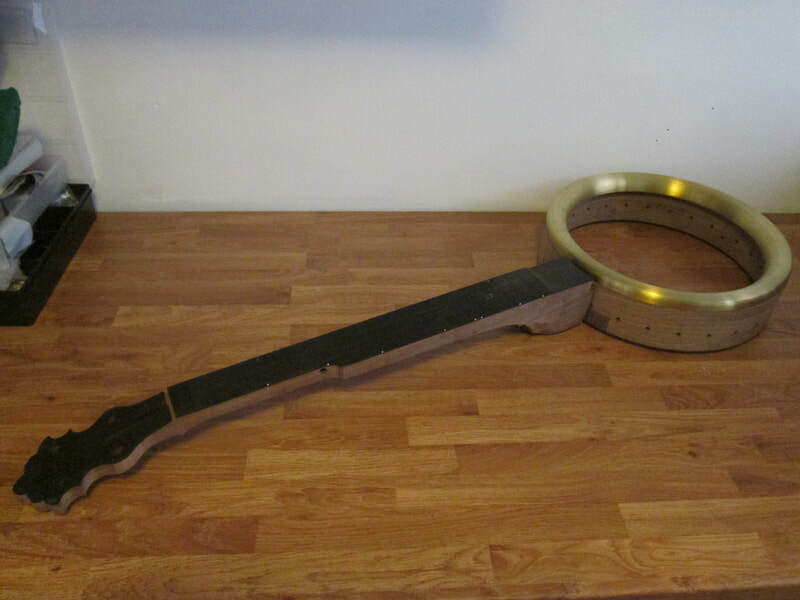 Spent the first half of the week getting Bob's banjo ready for oiling, should be ready for assembly by the end of next week. 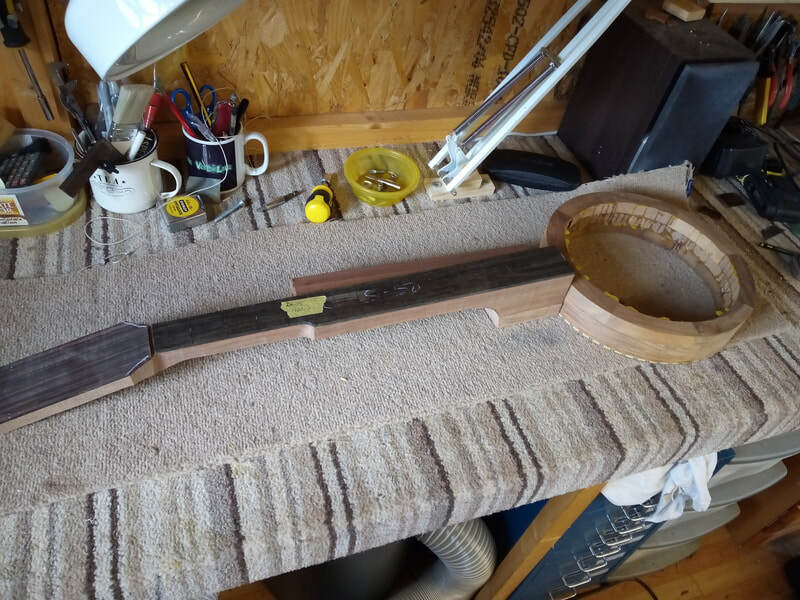 Yesterday and this morning I got stuck into cutting inlay for the next few banjos, a few more bits to cut, some filing and they should be ready to inset next week. A quick update, before I put my feet up for the rest of the year! 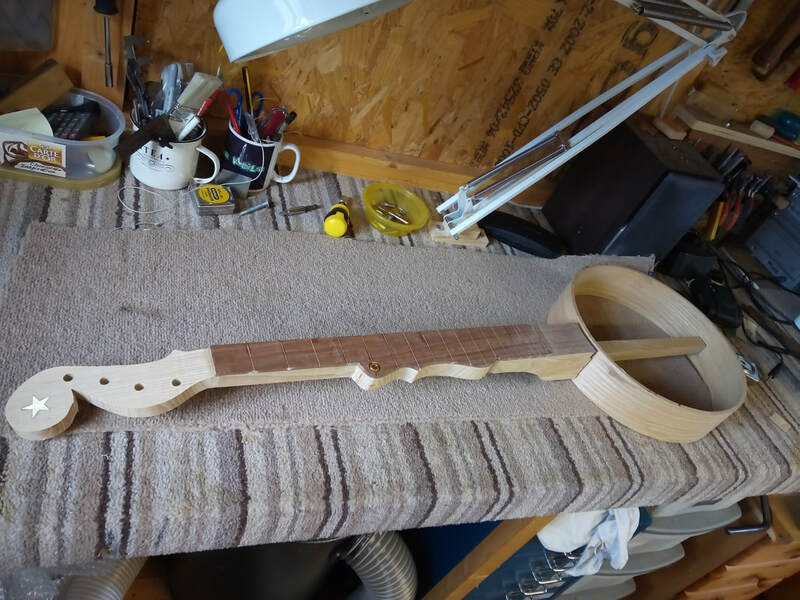 Bob's 6- string, semi-fretless, Ziricote banjo is gonna be cool, it should be the first to roll of the bench early next year, closely followed by the other 4. 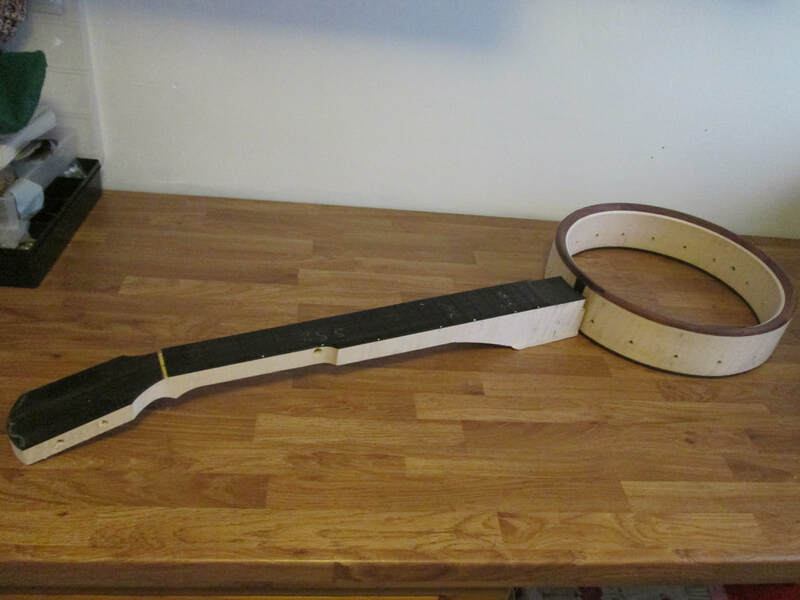 Just need to install the frets, carve the neck, scrape/sand,oil and stretch a goat skin on - simple! 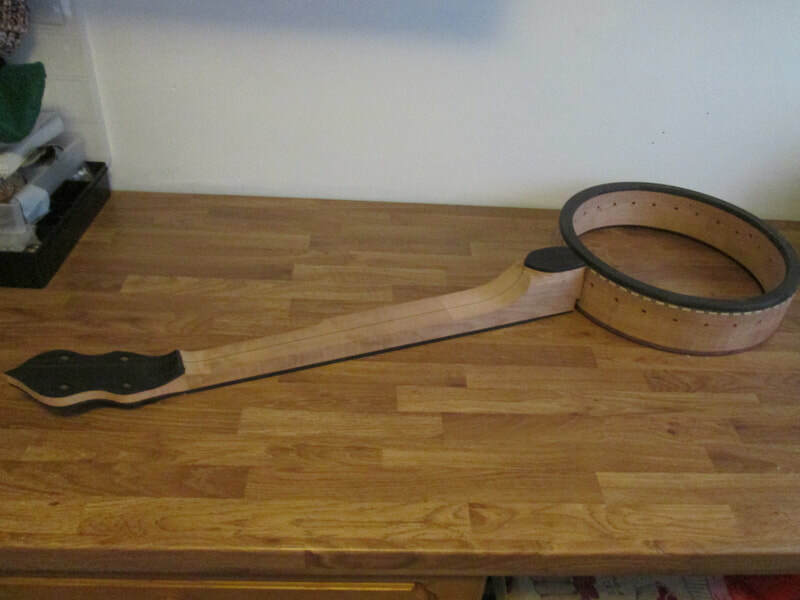 Davy's Cherry banjo is also looking cool, I managed to glue the Ebony rear peghead veneer on and shape the head. Most of the fingerboard inlay is done, 1 star is missing from the scoop(I somehow lost it when inlaying the others! 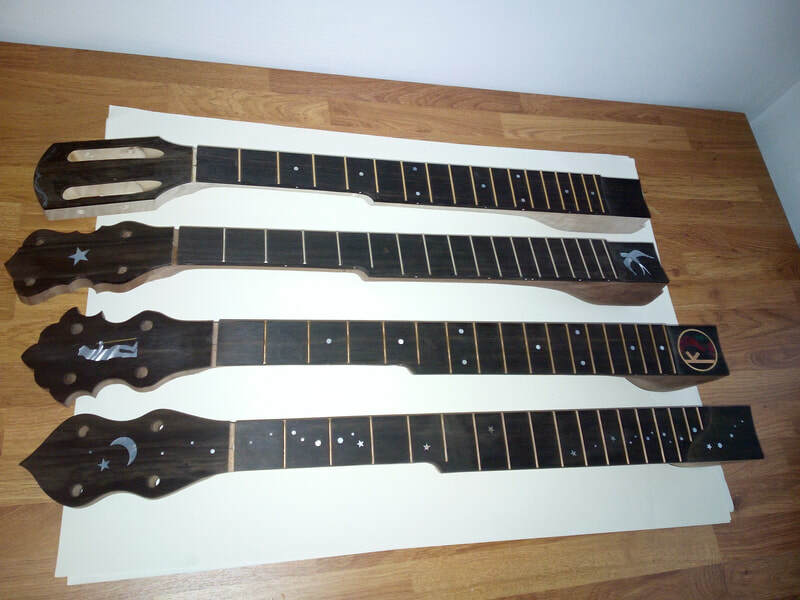 ), just need to inlay a moon and star in the peghead, Cherry blossom on the heel and then get the frets in. Some tricky inlay still to cut for Andrew's banjo. This one is going to be armed with a brass rod/Dobson tone ring combo, also with a goat skin, it should sound pretty sweet. On the right, is Tom's Walnut 'Dobson', this one will have some nice inlay in the scoop. The left banjo is the 'stock', flamed Maple I've been working on for a while. 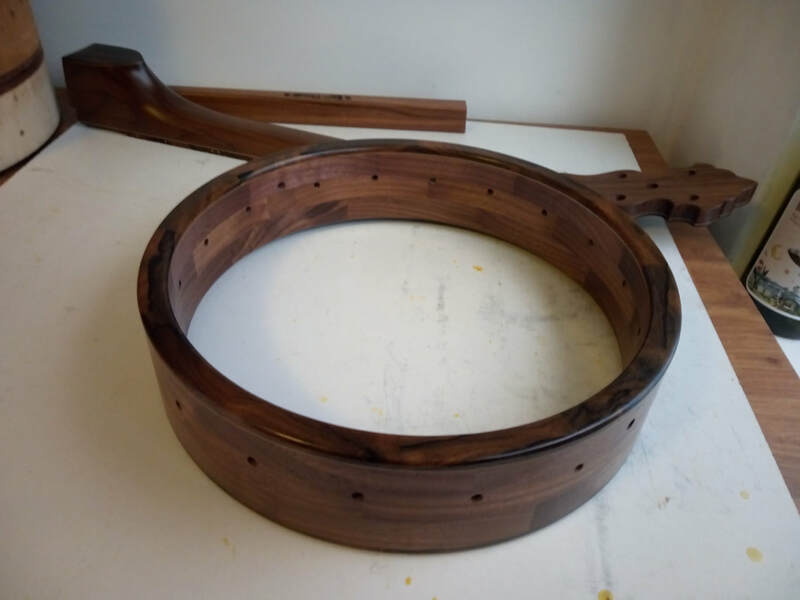 Rosewood tone ring, Ebony rim cap, it will be a slotted peghead and a 25.5" scale length. It will be for sale in a couple of months! Happy holidays and a funky New Year to all of my customers, have a good one! Not quite sure what happened to this week, I can't figure out how I managed to get so little done! Still, I managed to profile neck necks, install side dots, glue on heel caps and shape 3 of the pegheads, I need to glue the rear overlay on Davy's before shaping. I need to pull my finger out next week, as it will be the last full week before the kids finish school for the holidays and bedlam descends! 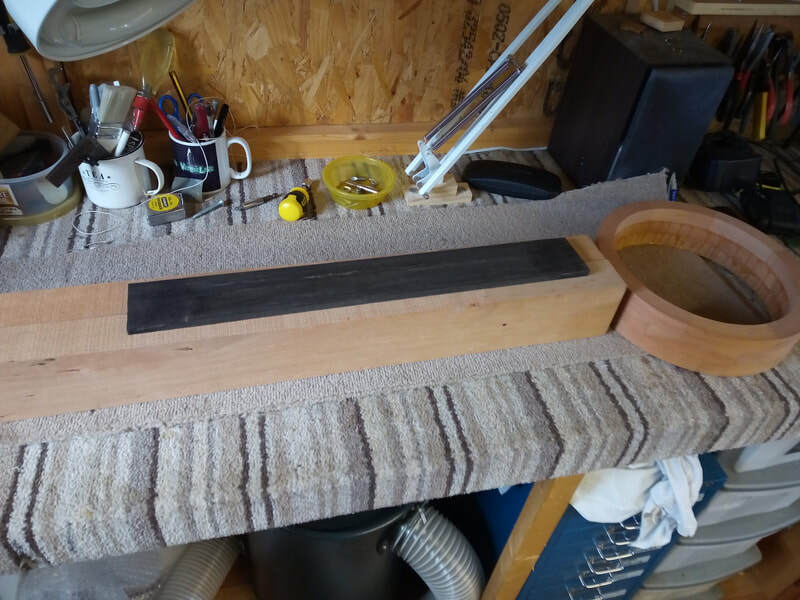 The plan is to cut the heel fits, get the other 2 pegheads finished, scoopy scoop, glue dowel sticks and get the rims ready for final sanding.